Little Sun, the creator of the portable, solar-powered Little Sun lamp, has been awarded a $5 million impact investment by Bloomberg Philanthropies. This is Bloomberg Philanthropies first-ever impact investment and will provide a low interest rate loan that will allow Little Sun to grow its social business, and provide more people and businesses across Africa with clean and affordable energy. The foundation undertook a rigorous due diligence process to evaluate the viability of the Little Sun business model and determined that solar powered lamps can provide enormous environmental and social benefits. “I am thrilled by the confidence that Michael Bloomberg and his great team at Bloomberg Philanthropies have shown toward our unique social business model and our aim to bring light to people living off the energy grid. To promote solar power in the shape of a Little Sun is to invest in radical change for the lives of many while, at the same time, caring for the planet we share. Holding hands with the sun is holding hands with the future,” said Little Sun co-founder and artist Olafur Eliasson. “With a Little Sun in your hand, you become a power station – charging your lamp in the sun, you also empower yourself. Access to energy and light allows you to determine the direction of your life,” he adds. Little Sun, one of the companies dedicatedly working with the Lighting Africa Program to increase access to clean lighting, sells its lamp through a distribution network of local entrepreneurs in Ethiopia, Uganda, Kenya, Burundi, Nigeria, Senegal, South Africa, and Zimbabwe. Currently, households in Africa not connected to the electric grid can spend as much as 20% of their total incomes on kerosene, which is highly damaging to health and polluting. Globally kerosene use has been estimated to emit up to 200 million tons of carbon dioxide annually, which is the equivalent of emissions from approximately 60 large U.S. coal plants. Companies such as the Little Sun are developing and marketing solar lanterns as sustainable lighting alternatives for communities not connected to national electricity grids. To provide the greatest number of people with access to the benefits of solar-powered lighting, the Little Sun lamp is designed and priced for affordability at the lowest end of the market, the bottom of the pyramid. 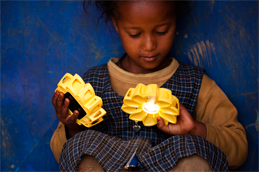 The Little Sun lamp lasts two to three years before needing a battery replacement, and can save households up to 90% of their expenditure on kerosene over a three year period. The lamp’s exceptional design and engineering has made it popular, not just in areas without electricity but around the world. Little Sun is sold at museum stores and other outlets in regions including the U.S. and Europe, at a higher price, utilizing the profits from these sales to keep off-grid sales prices locally affordable and to kick-start local businesses in off-grid communities. The Little Sun project was launched in 2012 at the Tate Modern in London, where the lamp continues to be available for purchase. They are also available for purchase online and in museums, like the MoMA Design Store in New York City and select retail stores in the U.S. and Europe. Little Sun engages in projects with partners such as art institutions, international agencies, NGOs, and the private sector to raise global awareness of energy access and solar power.